THE WRITING BUDDHA - Opinions | Books | Movies: Some people are old at 18 and some are young even at 90!!! 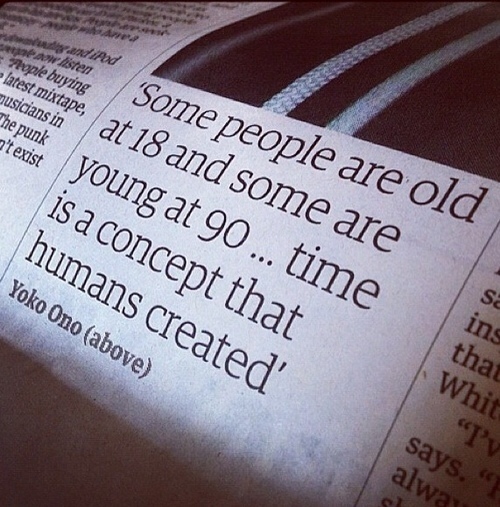 Some people are old at 18 and some are young even at 90!!! Every day starts with its own routine, drama and involvements. Our job should be of managing the whole day such that the permanent elements of our routines don't get affected and still we end up doing something magical and distinct which can help us in identifying something bizarre about ourselves. The moment we realize that we have done better than what we have been doing from a long time is the most wonderful moment of our life. Academic results may go up and down, people's view about you will change, parent's assumption about your future shall change but the learning and findings that you possess, will always strive you to go for excellence and this is what matters the most than any result or judgment. Our own moments give us the most pleasing segments of our life. But all that starts is with the first step that we take. If no step is taken towards building ourselves, there's no achievement, result and judgment. Our evolution should happen time to time. But what stops many of us from doing what it seems to be impossible for ourselves? It's age. The first excuse that a normal human being gives before taking a risk or learning something new is His/Her Age. This is where the self being retracts itself from achieving anything. Once you put your age or the amount of years that you are going to live aside, you will get to learn a lot from life and that will give you the biggest pleasure in life. Yoga and Meditation at some peaceful location like Himalayas or Mount Abu does nothing. Its only you who knows the potential of yourself. No location can bring any difference. In your bedroom itself, or while sitting in a crowded train, you can get an idea that can change your life and bring peace into it. But when an idea comes, the first thing that stops you from moving and accomplishing the imagined dreams is your age and risks involved with it. Daniel Radcliffe, the actor who played Harry Potter on screen, says that he wants to marry before crossing 30 as he wants to be energetic so that he can play football with his kids. He is exactly right while planning this. One should always have in mind at what age one wants to accomplish what. Considering marriage itself, doing it before 25 is risky as well as doing it after 30 is not less risky. The best time to marry is 27-28 years, according to me. This gives you enough months to stabilize your job as well as save money so that you can afford your own marriage and honeymoon without giving any burden on your parents' lifetime saving. In the same way, studying is the best that one can do in his/her life but stopping it after getting your Graduation degree is as bad as continuing to study till 30th age of your life. Age should always be kept in mind before knocking a door that needs a lot of time to open and welcome you inside. Though I don't believe in age much when it comes to doing things which I know I have to in any case. If I think that I have to do this and this, I prefer doing it today if its possible. If it's not, I already start walking slow steps towards the direction of my dreams so that when the appropriate age comes, I would be enough closer to achieve it. Suppose if I dream that I want to be an entrepreneur. That is currently not possible as I have at least 2-3 years of studies left. But I will start walking on the road already that will take me to create something of my own. So that once when my studies would be over and I would be in a job, I will already have all the executions planned. I would have decided what capital I need to save from job to open my own adventure and race upon life to gain profits and feed my family. This is how things have to be planned seeing our age. It's never too late and nor its too early. You can always manage your activities according to your growing age.